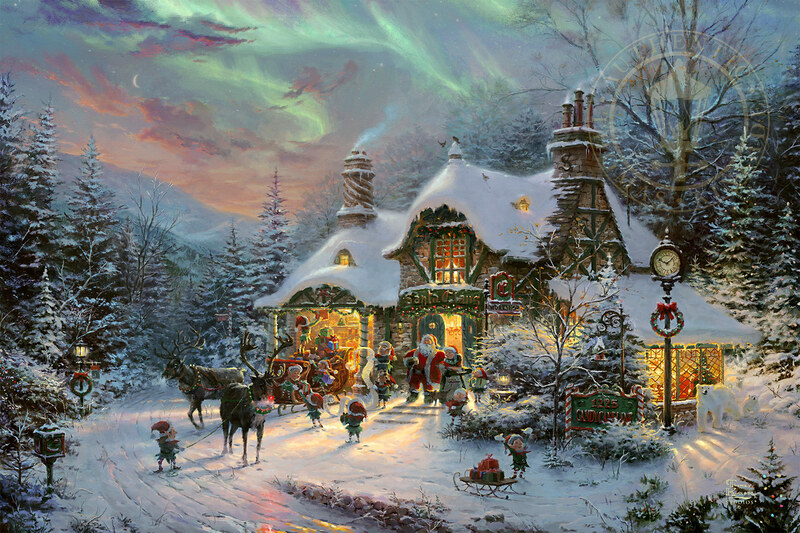 In Santa’s Night Before Christmas by Thomas Kinkade Studios, excitement is in the air as Santa’s elves pack his sleigh with presents to deliver to all the good children of the world. For the entire year, the residents of the North Pole have been joyfully working around the clock to get ready for Christmas Eve. As the time for departure approaches, the brilliant northern lights have lit up the sky with a dazzling display of auroral light; creating the perfect scene to start Santa’s magical journey. Santa’s Reindeer are eager and ready for takeoff. Mrs. Clause has come outside to see her husband off. 1225 Candy Cane Lane pays tribute to the actual holiday date of Christmas Day. A family of Polar Bears are eager to join the Christmas Eve festivities. Santa’s Workshop is in a prime location, right next to the iconic North Pole marker!